"The Beast" as one of "America's Most Scariest Haunted Houses"
What tends to scare people the most is the unexpected. These places are pretty unexpected! One of the finest haunts is the 100,000 square foot behemoth known as the Beast. It’s ghost effects rival those of Disney’s Haunted Mansion, and visitors exit the building via a four-story slide. It’s all unforgettable! 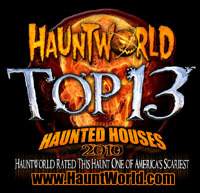 Rated Best in Horror, Scariest, Most Terrifying, Thrillingly Fun Haunted Houses in the U.S. The Beast may well be one of the largest haunts I have ever gone through. The expanse of these scenes is stunning! The Beast is just insanely huge, and the open format scenes are absolutely original. Judging from the screams that pour out of them, there’s some seriously scary stuff going on inside!